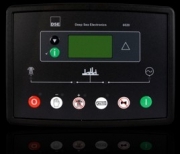 The DSE3110 can be utilised as a Manual or Auto Start Module for single generating set applications and forms part of DSE's next generation of control modules. The module has been designed to work with electronic and non-electronic engines providing advanced engine monitoring and protection features. The DSE3110 includes a back-lit LCD display which clearly shows the status of the engine at all times. The module monitors engine speed, frequency, voltage and run hours and also displays the warning and shutdown status of the engine. The module includes six digital inputs and four outputs. The module can either be programmed using the front panel or by using the DSE Configuration Suite PC software. The module is available in two variants: Magnetic Pick-up and Canbus.